In a saucepan, off the heat, whisk together the egg yolks, sugar and vanilla until the mixture lightens in colour. Add the hot milk slowly while whisking. Cook over low heat, stirring constantly with a wooden spoon, for about 15 minutes or until the mixture coats easily the back of a spoon. Remove from the heat, pour into a bowl and let cool. Cover and refrigerate for 2 to 3 hours. In the meantime, prepare the floating island. With the rack in the middle position, preheat the oven to 180 °C (350 °F). Butter a 2 litres (8 cups) capacity and about 10-cm (4-inch) high domed tube pan (with or without ornaments). In a bowl, with an electric mixer, beat the egg whites until soft peaks forms. Add the sugar and vanilla. Beat for 2 to 3 minutes or until stiff peaks form. Spread the meringue into the pan, pressing well to avoid leaving air bubbles. Tap the pan on the counter, then place in a large baking dish filled with hot water halfway up the pan. Bake for about 25 minutes. Remove from the oven, run a knife around the top of the meringue to fully detach it from the pan. Unmould onto a buttered plate. In a bowl, combine the strawberries and sugar. Let stand for about 10 minutes to allow the sugar to dissolve completely. Pour the cold custard in a large and deep serving bowl. Add the floating island. Drizzle with the strawberry salsa and serve. 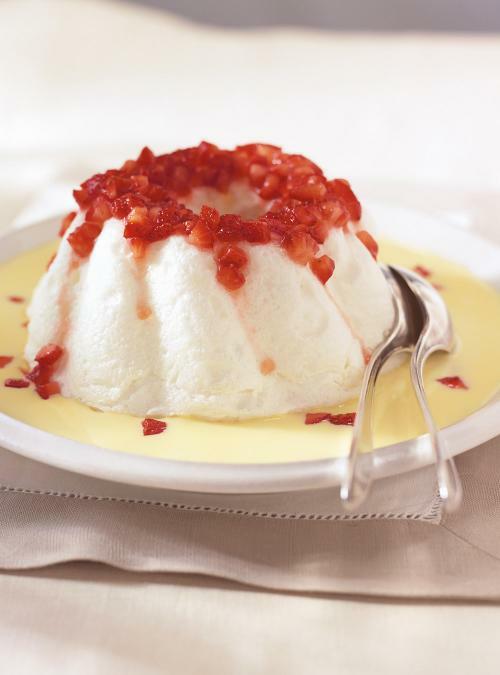 Customize your floating island I love this dessert because you can prepare it in a variety of ways, according to your wishes, ingredients and time available. Instead of baking the meringue in a mold, form meringue dumplings with two spoons and poach them in simmering milk, to be later used to prepare your custard. In a hurry? Poach your meringue in the microwave. Just to put a couple of meringue dumpling in a large dish filled with a little water and cook for about 25 seconds on high. 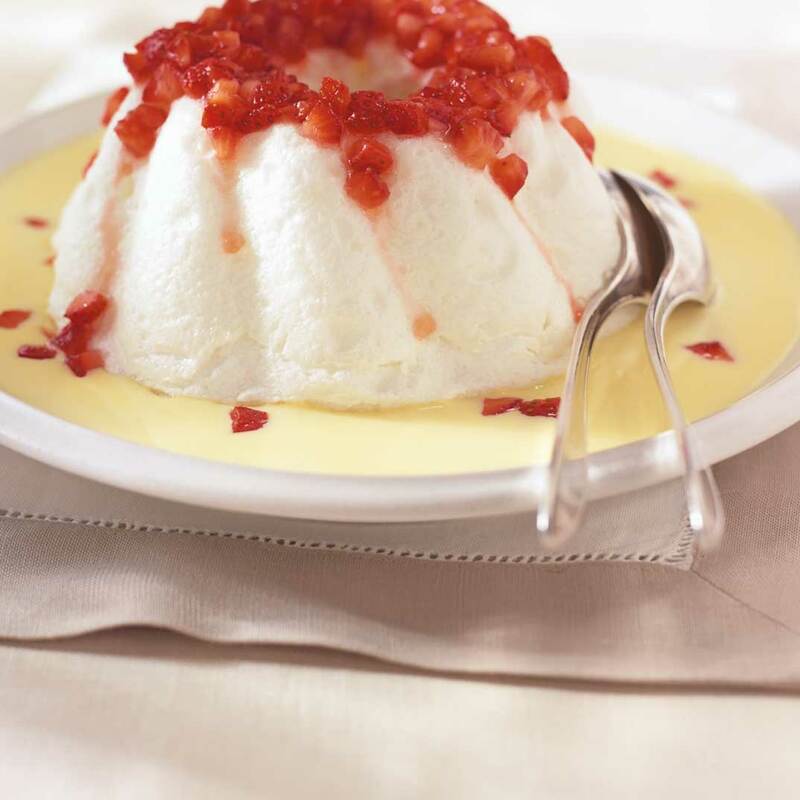 You can also serve your floating island on a flavored custard. For example, add pieces of semisweet dark chocolate to your custard just before removing from the water bath. Stir to melt and put in fridge. For a coffee custard, replace about 60 ml (1/4 cup) of milk by the same amount of full-bodied espresso.